Hiya guys! I feel so shameful today. I realize that I have a few posts that I have not put up that I wanted to for weeks. As a result, you'll be seeing some days this week and next have two posts or even some during the weekends. There are three to four Halloween collections I've been dying to share with you so look forward to that. Today I have the most none Fall / Halloween nails in history haha. But as you guys might know I've been part of the he picks my polish challenge on Facebook for the past few months. This month there was a little twist and we were allowed to have a 'she' instead of a 'he' pick our polish for us. I was really excited about the switch up and knew immediately that I wanted my mom to do the challenge. She actually picked out some really great colors… maybe not very Fall colors but still great colors haha. I was still a little stumped on what to do designwise so I think maybe I went a little bit too simple. It's actually kind of funny because this morning I liked this mani a whole lot less then what I actually do now. Truth be told, mom told me this morning she actually didn't like what I came up with haha. I don't find it upsetting or anything, she made a few suggestions of things I could of done instead that made me giggle. Christmas Tree was her top choice. With these colors, not quite sure what she was thinking but she's adorable for trying to get me to be creative. Regardless, I'm really liking the way this came out now and color selection. Is it me or does this sort of have a retro feeling? Definitely digging it. 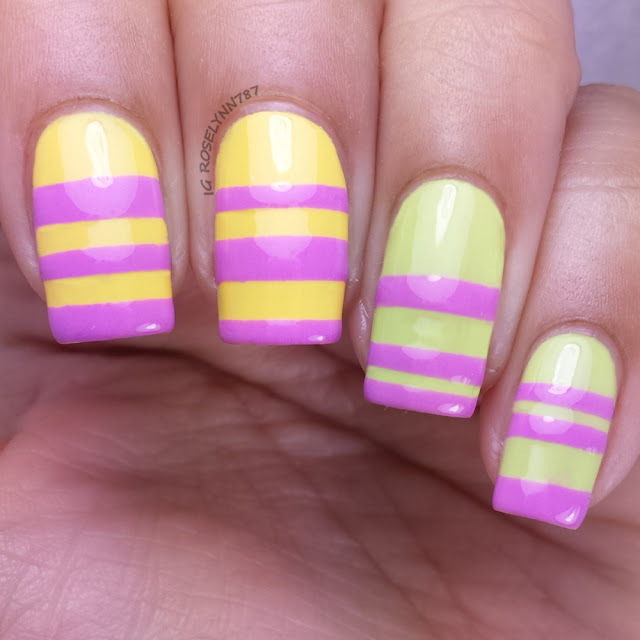 Polishes used Julie G Canary Islands, Maybelline's Ultraviolet, and Lime Accent. I finally put some of my nail vinyls to work and used them to create these great stripes. If you've never tried them before I definitely recommend picking some up (especially the chevron ones). Hope you guys like my mani for this month's challenge, be sure to check out the other participants down below. Not fall colors, but gorgeous none the less! Haha thanks a lot. I think I should of told her to pick Fall Colors cause the yellow was good but it went down hill from there lol. You mom is still harboring Summer thoughts! These are really pretty and she did a great job on picking out colors. The design is classic! Thank you very much. I definitely agree I think I'll have her pick out colors more often. She did way better than all the guys combined for the last few months haha.